NEWBORN Baby Panda SET, Panda Boy Hat and Diaper Cover, Panda Girl Hat and Diaper Cover, White with Black Ears, Baby Photo Props, Baby Gift. This adorable SET is perfect for a gift, for your newborn baby, or great for photo props! NEWBORN 0 to 1 Months Panda SET, White with Black Ears and Diaper Cover with Black Pom Pom. Super Cute. Great for Photo Shoots, Baby announcement cards. This NEWBORN size is for 0-1 months old (maybe 2 months). If you would like bigger size please view my other listings or contact me. Please note: larger sizes cost more. Make sure you purchase the size you need. Newborn Fits head size approx. 11"-13"
Hand wash in cold water with mild soap and lay flat to dry. Thank you so much for beautifull pictures done by Sandra. This HAT is made to order NOT ready to ship. Please check my turnaround time. All designs and photos from CHUNKY MONKEY BEANIES are protected by copyright law. Please do not copy or use without permission. NEWBORN Baby Panda Hat, Flapper Baby Boy Hat, Baby Girl Hat, White with Black Ears, Baby Photo Props, Baby Gift, Baby Birth Cards. 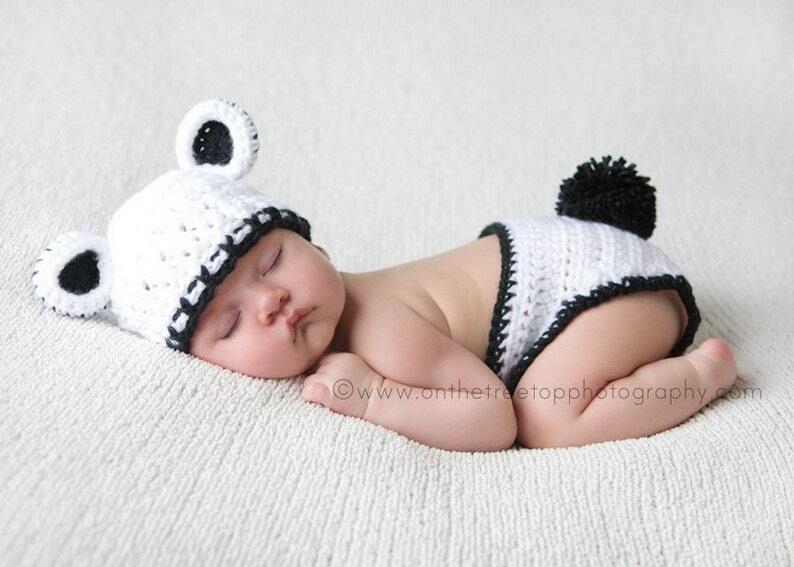 Baby Boy Hat, Baby Girl Hat, 0 to 3 Months Baby Panda Hat, Panda Hat, White with Black Ears. Newborn Photo Props. Baby Shower Gift. Baby Boy Hat, 3 to 6 Months Baby Hat, Baby Panda Hat, Boy Panda Hat, Baby Girl Hat, White with Black Ears. Photo Props. Handmade Kids Hat. 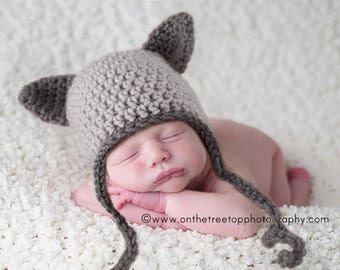 NEWBORN Baby Cat Hat, Baby Boy Cat Hat, Baby Girl Cat Hat, Cat Hat, Baby Cat Hat, Black with White Ears, Baby Photo Props, Hat for Fall. Baby Cat Hat, Baby Boy Cat Hat, Baby Girl Cat Hat, Cat Hat, Baby Cat Hat, Black with White Ears, Baby Photo Props, Hat for Fall. 6 to 12 Months Panda Hat - Baby Boy Hat or Baby Girl Hat - Crochet Flapper Hat, White with Black Ears. Photo Shoots. Baby Hat. Baby Gift. Newborn Baby Boy Hat, 0 to 1 Months Baby Boy Monkey Hat, Baby Flapper Beanie, Chocolate Brown with Cream Ears. Baby Photo Props. Baby Gift. Baby Boy Hat, 0 to 3 Months Baby Boy Teddy Bear Hat, Boy Flapper Beanie, Beige with Ears. Newborn Photo Props. Baby Shower Gift. This was shipped fast and absolutely perfect! Beautiful craftsmanship, can't wait to use it for our little one! Newborn Hat, Newborn Boy Hat, Baby Boy Teddy Bear Hat, Light Grey Hat with Blue Ears, Newborn Photo Props. Baby Shower Gift. Baby Boy Gift. It is perfect! can’t wait for my baby girl to wear! Quick turnaround and shipping! 100% recommend! NEWBORN Baby Girl Hat snd Dipper Cover, Baby Girl Aviator Hat, Baby Girl Pilot Hat, Aviator Hat, Cream and Pink with Goggles. Photo Props. Any item still in new condition can be returned for a full refund minus the shipping costs or exchanged within 15 days of purchase "you PAY all extra shipping costs". If you need to make a return or exchange please email or convo me. ONCE ANY ITEM LEAVES MY OFFICE, I AM NO LONGER RESPONSIBLE FOR LOST PACKAGES WITH THE POST OFFICE...PLEASE PURCHASE INSURANCE IF YOU WOULD LIKE. If the item comes back because of the wrong address and the package is not deliverable, it is the buyers responsibility to pay for shipment to go out again. If it is my fault, I will ship it out again. If you would like to purchase insurance, please let me know and I will be glad to help. BECAUSE OF CUSTOMS, ALL INTERNATIONAL SHIPMENTS MAY TAKE 15-30 BUSINESS DAYS -SOMETIMES LONGER (shipping time is not included into my turnaround time). Sorry, USPS does NOT provide tracking/delivery confirmation with Fist Class International Orders. - If you'd like Flat Rate Priority it costs $25-30 depending on your Country and it takes 6-15 business days to arrive that way you will have trucking/delivery number. Thank you for your patients!!! All designs and photos from ChunkyMonkeyBeanies are protected by copyright law. Please do not copy or use without permission. NEWBORN Baby Boy Hat, 0 to 1 Months Baby Boy Monkey Hat, Baby Flapper Hat, Chocolate Brown, Pale Blue Ears. Baby Photo Props. Baby Gift. NEWBORN Baby Boy Hat, Baby Boy Frog Hat, Baby Flapper Hat, Olive with Black Ears. Professional Photo Props. Baby Gift. Fall Collection. Boy Panda Hat, 12 to 24 Months Baby Panda Hat, Crochet Flapper Beanie, White with Black Ears. Super Cute. Great for Photo Shoots. Baby Boy Hat, 3 to 6 Months Baby Boy Hat, Boy Monkey Hat, Boy Crochet Hat, Baby Blue with Ears. Baby Photo Props. Baby Shower Gift. Kids. Baby Boy Hat, 0 to 3 Months Baby Boy Chunky Monkey Hat, Baby Crochet Flapper Beanie, Baby Blue with Ears. Baby Photo Props. Baby Gift.